We all know that no decal looks as good as paint and so here is an opportunity to at least have some of the markings on your next project be as well done on your model as the camouflage scheme that you apply. 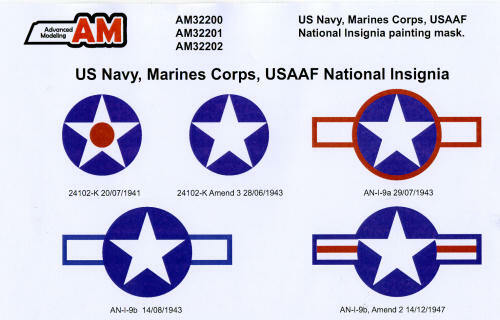 These are painting masks and this set offers four sheets of type AN-I-9b c 14/08/1943 insignia (the one with the 'wings') in 50, 45, 40 and 35 inch sizes. These also include the all-white types as often used on late war Hellcats. It also appears that there are 24102-K Amend 3 28/06/1943 insignia on the sheets as well. Other sheets have the other styles and sizes. The masks themselves are on clear plastic sheeting, which at first seems that there is nothing there. However, close inspection will show the masks. These are not the 'peel and stick' variety that one might expect. Instead, they are slightly tacky. 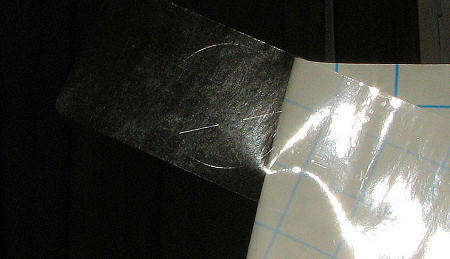 One first removes the mask from the backing, dips the mask in tepid water to prevent it from completely sticking, moves it into position, then presses down on the mask with a soft cloth to remove all the excess water. Once that is done, you can then continue with your painting. In all, it looks like a great way to get the best of insignia on your next large scale model. The masks themselves are clear so it makes that much easier to place on the model. Some of these are of such a size that they would probably work well on large 1/48 models. No website was given for ordering, but you can contact Advanced Modeling at putnikov@front.ru if interested in getting his full line of masks, which at the moment seems to be concentrating on national insignia for the US and Germany. My thanks to Advanced Modeling for the review sheet.